Cheesy Italian Bread is made with a homemade loaf of chewy Italian Bread, topped with a butter garlic spread and lots of cheese for that ooey gooey cheesy fun! IS it all about Grumpy? Some of you may think it is! I have to admit, my world does revolve around him. Isn’t that the way it is supposed to be when your in love? lol. I know that is how it is with my mom and dad! In all honesty, and those who have been reading here for awhile know, my world revolves around all of those I love. I am very lucky to have so many special people in my life! So yeah, most of the time, it is all about Grumpy. I think he kind of likes all the attention too. Even though he would never admit it. Chris did get to enjoy some of this cheesy garlic bread too. All either one of my boys has to do is ask and they shall receive (as long as mom has the means and they are being reasonable!). Yeah, so its all about those boys of mine too. Of the three of us who had some of this cheesy garlic bread there isn’t one who didn’t love it. If you make the Italian Bread or if you just go out and buy some, this cheesy garlic bread is worth making to go with your next meal. Whether it be Chicken Penne Prima Vera or Grilled Shrimp (of course two things I had some of that cheesy garlic bread with!). My husband and I would devour that bread! It would be perfect with almost any dinner… but, especially with Penne ala Vodka… or Penne Arrabiata… yummmmm! This looks like the perfect garlic bread! Now that's my kind of bread! I could take a big bite right now. You have convinced me to take out my bread machine to make this Italian Bread and Garlic Bread. Cheese and bread are two of my favorite things! Yours looks so good! 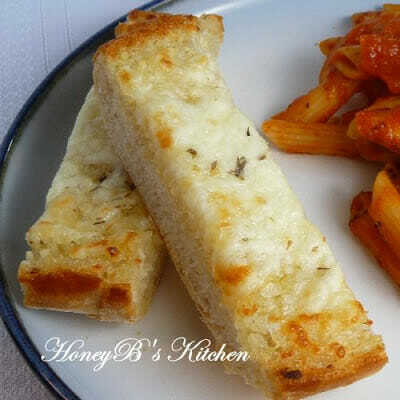 cheesy garlic bread is one of my favorites, it goes so well a lot of dishes. I wish I can have a slice of yours! I could eat that whole thing!! And yes it is all about the ones you love. My boyfriend gets what he wants in the kitchen, and I don't mind making it!! It crazy what love can do to you. I agree with you, my world does revolve around the one I love too. I love cheesy garlic bread – yum. I think your love for Grumpy is sweet – I feel the same way about my guy. Great photographs!!! That bread is really talking to me. I had to laugh about your post title…I think Grumpy and my husband must be related. Grumpy must be loving all this "stardom"!! I could take a big bite of this bread. It looks so good. I am absolutely mad over the looks of this cheesy wonder! One of my favorite things to read on your blog is about your love for your guys! I totally get that! 100%! That is one of the BEST garlic breads I've seen. gotta make this bread. Looks great. Looks great Shelby! Cheesy garlic bread is my favorite. There's nothing like cheesy garlic bread! This one looks so good! That bread would not last in my house. And yes you have to keep Grumpy happy! That garlic bread looks so good! I like to add cheese to garlic bread as well! What a incredible bread! Sounds so tasteful! So simple to do! Yea I understand, most of the time is about him. What he likes to eat, what he hates…The bread sounds lovely! Oh man, love garlic bread with cheese. Yum! It's been a long time! Glad to see you still have such unbelievable (but I'll believe!) yummy treats! I think for those of us who enjoy cooking and baking, we're always willing to go the extra mile to make something our loved ones really like. 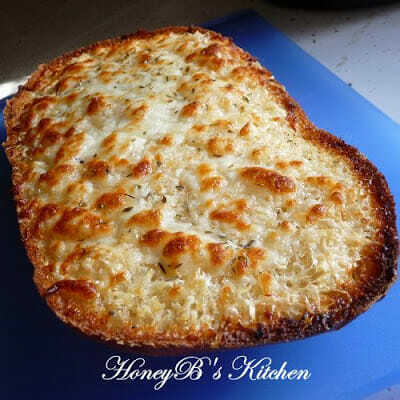 Great looking cheesy garlic bread! Now this is my kind of garlic bread! Don't tell, but on a really busy day, I love to have cheesy garlic bread like this for dinner with a nice salad and side of fresh fruit. Lucky Grumpy. These are some wonderful garlic bread sticks Shelby! I could eat the entire loaf at one sitting. I'm not kidding. Really. Give me something like spaghetti and meatballs along with this bread and I'm all over it! i can not find permesan cheese.so wt should i use instead of it? I would go with a cheese that is aged and dry (extremely firm) If you can't find something like that it is ok to use any type of cheese that has a sharp flavor. I use asiago cheese often in place of parmesan. Good luck! This looks really delicious Shelby! My life does revolve around those i love, but I wouldn't have it any other way either! They are lucky to have such a wonderful wife and mother who makes delicious cheesy bread for them! This looks amazing!! Grumpy is a lucky man! This garlic bread looks delicious! We love cheese bread. We are having pasta tonight so I will have to make this. The perfect comfort food, nothing better than cheesy delicious bread. Yours looks divine! !